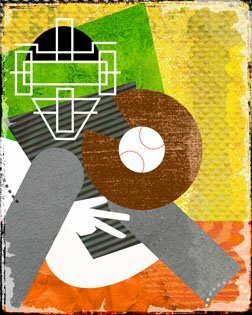 I am doing more on the baseball images so that I can hold my head (partially) up with the up and coming show. I love costume and how it relates to sports. The armor or body protection in sports is really kabuki (hockey, lacrosse, baseball catchers and umpires)--so an umpire may be in the mix in the next few weeks. I found some really great and really inexpensive frames at Target, the most wonderful and designcentric store in the world...maybe, not the world, but my tiny world as it stands today. Big fat black, nice ogees..We'll see how they work. The Nielsen Bainbridge frames are nice and inexpensive too (http://www.dickblick.com). Have been on the road for the past two days visiting my clients and trying out my new laptop--working out the kinks of the system.